The archbishop called zero-hours contracts ‘the reincarnation of an ancient evil’. Justin Welby has hit out at the gig economy, zero-hours contracts and firms like Amazon for paying "almost nothing" in taxes. 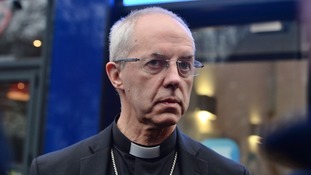 Austerity and Brexit are dividing Britons and causing a "schism" in society, the Archbishop of Canterbury has warned. The Most Rev Justin Welby told worshippers that much could be learnt from the Nativity story, where Jesus is "power seen in humility". This report reveals a culture of collusion concealment and protection within a church that put its own reputation before abuse victims. Sexual abuse by a bishop against young boys was hidden for years because the Church of England "colluded", Justin Welby has said. Justin Welby told Canterbury Cathedral that in the face of "pain and despair, grief and death" people should "not be afraid". The controversial report calling for the Church to adopt a "fresh tone and culture of welcome and support" for gay people was rejected. Justin Welby has said he was "completely unaware" of allegations of physical abuse involving a former colleague at a camp for teenage boys. The Archbishop of Canterbury addressed the "fear of terror" and the "economies of despair" in his annual Christmas sermon.